We are proud to partner with businesses and organizations across Michigan and the world! Learn more about our amazing partners below. Take your group to the next level in Irish-style music. Uneven Ground (UG) has partnered with Walk the Beat music organization in providing workshops to area schools focusing on Irish –style music and technique. UG can present a workshop funded by Walk the Beat then perform a public concert to help fund your school’s fiddle group, if desired. We are open to any combination that fits your fiddle program plus guide you through your workshop’s funding through Walk the Beat. Uneven Ground has given Walk the Beat-funded workshops to the Mona Shores High School and Middle School Fiddlers and the Grand Haven High School fiddle group GOTAK. Contact us about who we can help your school. Join Larry as he hosts a traditional Irish music session every third Saturday of the month from 1-3 p.m. at the Loutit District Library. Beginners to advanced players are welcome. If you don’t play an instrument, just come to listen. Music can be provided to the musicians upon request. For information on the next session, visit the library’s website, www.loutitlibrary.org or contact Larry here. 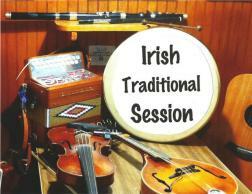 Search here for all traditional Irish music sessions from Western Michigan to around the world. A unique vendor of quality gifts, jewelry, and assorted Celtic goods. We will be performing at this incredible event, Michigan's largest Irish music festival.